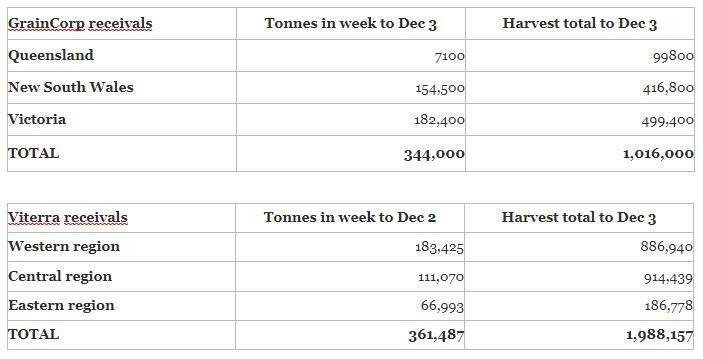 GRAIN receivals from the eastern Australian harvest to date have hit 3 million tonnes (Mt), with GrainCorp’s intake in eastern states now at 1Mt as of 3 December, and Viterra’s in South Australia at just under 2Mt as of 2 December, according to their latest weekly harvest reports. 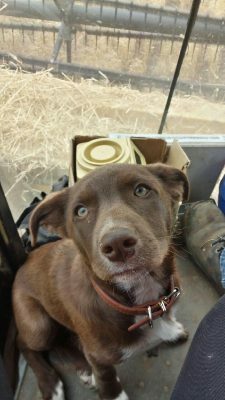 GrainCorp said the Queensland harvest was now in its final stages and harvest activity had returned to normal across southern New South Wales and Victoria after rain disruptions last week. In South Australia, Viterra received close to 90,000t of grain on both Saturday and Sunday, following a rain-interrupted start to the week. In the western region, scattered rain slowed harvest activity, with 130,000t of its total for the week delivered on Friday, Saturday and Sunday. Viterra said western-region deliveries of wheat had increased as growers finished harvesting barley, and an increase in pulse deliveries had been noted in the cooler weather. In the central region, most deliveries were received into sites in the Mid North as far south as Roseworthy, and on the Yorke Peninsula. Receivals in the central region increased towards the end of last week, but windy conditions reduced deliveries on Sunday. The eastern region had its busiest week for the harvest to date, with canola the most delivered commodity.